To this day, 1937 is the year most that most Azerbaijanis associate with Stalin's Purges because so many people were arrested, executed, imprisoned or sent into exile. The atmosphere of fear and suspicion permeated everywhere. Ahmad Jafarzade was eight years old at the time and so he writes this short piece from the perspective of a young boy. Here we see the influence of his background in drama, as this work could easily be adapted for stage. It is published here in English for the first time. It was a bit after midnight when I heard some screams. I ran out into the yard. Our narrow alley was already full of people. Everyone was looking into the street, horrified. But no one had courage to step beyond the alley into the main street. I was barely able to squeeze through the crowd to reach the other end. Old man Asgar, who was standing at the end of our alley, wouldn't let me pass into the main street. I barely managed to squeeze into a position so I could see what was happening. A short distance away - about 10-15 meters - a large car was parked. It wasn't like an ordinary car. People used to call such cars "Dog Cars" (To this day, police are still often referred to as "dogs" in Azerbaijan; hence, "dog cars") or "Black Ravens" (Vehicle used by the secret police for transporting people who were arrested to the central headquarters and prison). Even though many people were watching from their doors and windows, not a single person dared to go out into the main street. Suddenly, we heard screams coming from one of the nearby courtyards. Four men in uniform from the NKVD (Narodnyi Komissariat Vnutrennikh Del - acronym for the dreaded People's Commissariat for Internal Affairs. The NKVD would become the forerunner of the KGB - Komitet Gosudarstvennoy Bezopasnosti or State Security Committee) were dragging our neighbor Sakina towards the car. She was a woman who worked at some institute. Sakina's mother-in-law Umleyla was running after her - barefoot and with no head covering. Two little girls - ages 3 and 5 - were hanging onto her skirt. The baby in her arms was screaming. NKVD soldiers opened the back door of the car and shoved Sakina in. When Umleyla saw this, she ran forward shouting: "People, for God's sake! At least let her take her kids!" When Sakina recognized Umleyla's voice, she turned back and tried to jump out of the car. A soldier standing near the car door struck Sakina in the chest with his rifle. Sakina fell back, collapsing in the back seat of the car. When Umleyla saw how they were treating her daughter-in-law, she went out of her mind. She ran out, screaming: "Oh, my God! Oh, my God! For God's sake, let me give her the kids. How am I going to take care of this baby? What about the kids?!" One of the soldiers pushed her away: "Von otsyuda!" ["Get out of here!" in Russian]. Holding the baby in one arm, Umleyla, grabbed onto the soldier's sleeve: "For the sake of the severed arms of Hazrat Abbas (Severed arms of Hazrat Abbas: Hazrat Abbas was one of the grandchildren of the Prophet Muhammad. Along with 72 close family members and friends, Abbas was killed near Kerbala [in present-day Iraq] by the Sunnis. He was known particularly for being handsome and very brave) let the girl take her kids with her." Umleyla fell. The child fell, too, screaming. The soldier pointed his rifle at her. But Umleyla would not yield - maybe because she didn't know what would happen, or maybe she was too frightened and confused to know what to do. She stood up and grabbed the soldier's hand. The NKVD agents who were closing the door of the car pushed the old woman away and started kicking her. Umleyla lost consciousness. The baby, lying near her, was shrieking, and the kids were screaming on the other side. Everyone in the neighborhood - watching from their houses, yards, alleys, and even from their rooftops - was terrified. They were too scared to run to assist her. Suddenly old Khadija, who lived in our apartment, ran out into the street and started shouting: "God! Where are you? How can You allow such injustice? May the world perish! What agony! What a disaster!" Some of the men grabbed her and brought her back into the alley. The car drove away. It was almost morning. Loud screams awakened me. Mom had wrapped her veil around her head and stepped out. I followed after her. The door to the street was open. Neighbors were looking out into the alley whispering to one another. Someone was screaming in the house opposite ours. Then the door opened. Three NKVD workers pushed old Khadija into the alley. She was crying, begging them. She refused to budge. When the NKVD workers picked her up, Khadija screamed even louder, and held onto the walls of the alleyway. She started shrieking in such a strange high-pitched voice: "Holy Hazrat Abbas! Holy Hazrat Abbas! Holy Hazrat Abbas!" The NKVD soldiers started beating her arms with their rifles. They tried to pull her hands off the rock walls. Khadija's husband was standing nearby, weeping. He dared not approach his wife though she was begging for help. Perhaps he was embarrassed to go out into the street undressed or, else too frightened by the NKVD agents. Finally, Khadija weakened; her strength gave out. She fell back onto the rocky pavement and hit her head. Blood splattered on her white hair. The NKVD agents grabbed the woman as she was crawling on the ground. They shoved her into the black car parked nearby. Although all the neighbors were crying and clawing at their faces (Clawing their faces: This is a tradition of self-mutilation among women associated with mourning, Scratching one's face to draw blood has not been practiced much for the past 20-30 years, but the practice may still exist in remote villages.) it's interesting that no one ever stopped by to visit the household of old Khadija to try to find out where they had taken her or why. Evening. Our neighbor Uncle Karim gathered all the neighbors together when he came home after work. A little later my mom came home frightened and told my sister: "Hurry! Grab all the books and take them into the yard and burn them." My sister was confused: "What are you talking about, mom!" she said. "Why burn the books?" Mom walked straight to the bookshelf without replying. "You're old enough to know! Haven't you heard that all the writers, poets and scientists have been charged as "Enemies of the People"? Should we risk being arrested for the sake of these books?" My sister pleaded: "Mom, they told us at school that only five or six people have been identified as "Enemies of the People". I'll just burn their books and everything will be fine. There's no need to burn all these books." My mother was an educated person. She knew that those who had been identified as "Enemies of the People" had already been killed. But Uncle Karim had warned her: "Stay out of trouble. Just take the books and throw them outside." My sister realized that there was no use to cry, but tears streaked down her cheeks as she pulled the books down off the shelf. A bonfire was blazing in the middle of the courtyard. Neighbors were piling the books near Uncle Karim who, after checking the first and last pages (First and last pages of the book: The first page is the title page with book title and author. The last page indicates the editor and various other professionals involved with the preparation of the publication) was tossing them onto the fire. 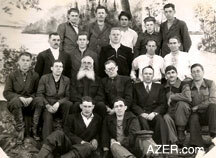 Left: Ahmad (standing far right) in 1956 after returning from prison in Siberia. Here he is with relatives from the village of Taghli. His brother Mammad is standing second from left. Ahmad's wife Zabita is the first woman seated on the left with little boy on her lap. Mammad's wife Zerkhanum is seated beside her. 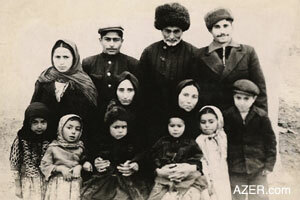 The children are from left to right: Gandaf, Narmina, Behruz, Azer, Kamala and Seyyad. "Uncle Karim, but this is 'Shahname' by Firdowsi. Why do we have to burn it?" "Just throw it on the fire. Don't you see that one of the translators is 'An Enemy of the People?'" "What about the Koroghlu epic?" "The compiler and editor is also 'An Enemy of the People.'" "But," my sister protested, "the author is the French writer Balzac." "The writer of the preface has been arrested." "These are the works of Sabir, Fuzuli, and Akhundov. Can I keep them?" "The first book - editor, the second one - compiler, the third one - writer of the preface. They are all 'Enemies of the People'. Do you want them to take away sister Kablayi because of these books?" "You, little girl, just get out of here! Do you even know who these people are who edited, compiled, wrote the prefaces of these books?" My sister didn't ask any more questions. Sobbing, she just took the books and threw them into the flames, It was already dark. But it seemed like afternoon in our neighborhood. Light from the flames had lit up every yard. In the beginning of the second period, teacher Aisha - the Class Party Chairman of the Faculty stepped into our classroom and told our teacher: "We have an important event. Stop the class and quietly take the children to the sports hall downstairs." Our teacher gathered the books on the table, lined us up in a row and escorted us to the sports hall. Teacher Aisha made us sit in the front row. Students in higher classes sat in the rows behind us. A little later, the school director - Teacher Ilyas - entered with several people and sat down at the table, which was covered with a red cloth. The director began to speak about the Socialist system and the struggles against its enemies. He asked us to be watchful and to denounce any Class Enemies. 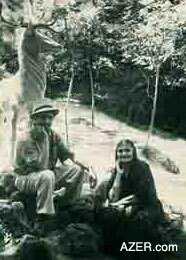 Left: Boyukkhanim Jafarzade visiting her son at Kislovodsk (Russia, close to Chechnya) during their holiday in 1960 after he was released prison camp. Ahmad had very good friends there as he had worked in a medical capacity in the camps and been able to prescribe less work for some of them so that they could prepare concerts, instead of cutting trees in minus 30-40 C degree weather. They called him Uncle Afgan ("Afgan" in Arabic means "Scream"). In conclusion, he told us: "Children, you are the happiest young people in the world. Nowhere in the world are children so joyful as you. Do your best to preserve this beautiful life, to protect and maintain this society that the proletariat has created. Now you are going to meet a Pioneer who has proven by his actions that he is a true Soviet child. The director stood up and turned towards the door and started applauding. The teachers and students took their cues from him: they stood up and applauded as well. The door opened. A young boy of about 11 or 12 years of age walked in like a soldier and approached the table. He was wearing a red Pioneer tie around his neck. We continued to applaud until the director motioned for us to stop. Everybody sat down. Someone we didn't know stood up and said: "Dear children, this Pioneer standing in front of you is a true hero. He has done a great service for the Bolshevik party and the Soviet government by denouncing an 'Enemy of the People', who had been carrying out acts of sabotage for many years. Follow his example. Be vigilant like he is. Now let's listen to our Pioneer hero Salim Mikayilov. He'll tell you how he denounced the enemy." We all became so curious. We were wondering how this young boy could denounce the enemy? After the applause died down, the Pioneer Hero stepped up to the front and with a high-pitched strained voice said: "I am a Soviet Pioneer. My father is the Bolshevik Party and my mother is the Soviet land. I am ready to sacrifice my life for them. My slogan for life is: "Always be vigilant" - words of the Pioneer group leader. I've been a Pioneer for two years. I always look for Class Enemies everywhere. In these past two years, I have informed the authorities about people who fast (Fast: A Muslim religious practice during the month of Ramadan when followers abstain from eating and drinking during the daylight hours), perform 'namaz' (To perform "namaz", means to pray. Devotees of Islam follow prescribed formulaic prayers at five specific times of the day), read the Quran, visit religious sites, invite guests into their homes, and who buy lots of products in stores. But my greatest act of courage was when I turned in my own father as "An Enemy of the People". Our director stood up when he heard these words, started applauding, and motioned for us all to start clapping as well. The Pioneer Hero continued his speech, gaining in self confidence as he continued: "I started noticing that a number of people were visiting my father. They used to come and close the door and start talking about something or other. I thought that if they were good people, they would not carry on in secret. That meant that my father was not a good person. When I found out that one of my father's guests was the former director of a high school, and the other one was a member of a khan's family, I understood that my father was really an 'Enemy of the People'. I reported this issue to the NKVD. My father was denounced as 'An Enemy of the People.' I invite all of you to be patriotic and watchful like me." The Director motioned for all of us to applaud. We continued for quite a while. One of the guests stood up and said: "Children, all of you are living in the old neighborhood of the city. There were a lot of seyids, mullahs, dervishes, hajis, karbalais, mashadis (Seyid: Holy descendent of prophet Muhammad of Islam; Mullah: Islamic clergy; Dervish: Member of a Sufi Muslim ascetic religious fraternity, known for their extreme poverty and austerity. They live as hermits, completely isolated from the world; Haji: Muslim who has been on a pilgrimage to Mecca in Saudi Arabia; Karbalai: Pilgrim who has visited the holy shrines in Karbala, Iraq; Mashadi: Pilgrim to Mashad, Iran. ), and other charlatans who used to live in this neighborhood. Many of them still live in our society pretending to be someone else. None of them can ever be a friend of the Soviet government. Your honorable duty is to be like this Pioneer Hero and expose these Class Enemies." On the opposite side of our school there was a one-store building that was used as a police station. People said that the basement could hold up to a couple hundred people. People who were arrested in the streets or in bazaars were brought there. Then that black car would come and haul those people away somewhere else. Lately, I had noticed that a lot of people were being brought there. Most of them were rather decent-looking people who wore good clothing. Whenever we would hear a noise outside, us kids would climb up on our desks and peer out of the window to see what was going on. Our teacher would threaten us, but we paid no attention to her. During the break today, one of the boys shouted: "Hey guys, hurry, come outside, the police are bringing a group of people from "Hamshari Palani" (a neighborhood community). "Oh, they arrested Seyid Mahammad Agha, too!" "Oh my God, Haji Rasul is there, too"
"Hey, Hamza, there's our neighbor Karbalai Iman." The Komsomols were pulling the beards of these seyids, mullahs, hajis, karbalais, mashadis and slapping their faces, spitting on them, and beating them on their heads. The NKVD workers were beating them with rubber truncheons. One of the Komsomols turned towards the crowd and announced: "Citizens, for many years, you have been kissing the hands of these scoundrels, rascals, liars, grafters, traitors, immoral seyids, mullahs, hajis, karbalais, and mashadis. You thought they were devout and honest people. They've been living off your money and lying to you for a very long time. There's no place for such people in a Socialist society." Another Komsomol continued: "They're drug addicts, gamblers and immoral people. See, this seyid personally taught me how to use narcotic drugs and insulted me. I spit on him, you spit on him, too! All of them are rascals." The third Komsomol kicked Haji Rasul in the back. The old man fell down and hurt his head. He could barely stand up. The Komsomol said: "I was a servant of this Haji. Spit on him! Hit him!" The people in the street were throwing stones at them. No one said anything. They took the group into the basement and beat them. Then the bell rang. A new movie was playing at the October Movie Theater (Many things were given the name October. It refers to the month when the 1917 Bolshevik Revolution took place. ) near the bazaar above the Hamshari Palani. Left: Ahmad with other prisoners at Kolyma prison camp in Siberia, 1956. It seems that prisoners dressed up for formal photos. Ahmad is seated on the first row, second from right, with his arm on his knee. This was the year that Ahmad was released following. Hundreds of thousands of prisoners were released that year - three years after Stalin's death. It was called "Onuchlar" (Thirteen). It was impossible to get tickets. It took us two days. The kids in our neighborhood had barely been able to buy any tickets at all that day. After begging them, they gave me a ticket, too. We arrived at the theater half an hour before the movie started. There were no empty seats; people were even sitting on the stairs between the rows. The lights went off. But instead of the movie, an announcement was made over the loudspeakers: "Dear movie goers! Before the movie is shown, we would like to conduct a brief session with our poets. They will recite some of their new poems for you." Someone started clapping. Everyone joined in. Five men and one woman went up on the stage. The director of the theater introduced them and then went backstage. We have burned the demons and evil ones. And torn up their books and notebooks. Open your eyes to the world my friend! Mullahs are cuckolds, seyids are bastards. Mashadi are liars, rascals, and child - perverts." Her sweat, dirt, breath is a cure for all your sorrows. [Atagha: Literally "flesh man" referring to Mir Movsum Agha (1883-1950) who was sought out in popular religion because of his own alleged abilities in faith healing. His grave is in Shuvalan, a town on the Absheron Peninsula, not far from Baku. He is still popular today more than 50 years after his death. During the Soviet period, faith healing was a taboo. Here the poem refers to new medicine to take the place of what the Soviets viewed as superstitious behavior]. Smiles appear on the people's faces. Our meadow changes color every day. Strings on the saz of the ashug smile. People are free, tongues are free. Flowers are free in the free gardens. The Party is our faith. We are moving towards progress. The poets were applauding after every section of the poem and the audience was joining them. Then one of them asked the audience: "Who is our enemy?" "Members of Musavat party who have been exposed as "Enemies of the People", scientists, poets, and writers who were their followers." One of the poets raised his hand and said: "Death to the Enemies of Socialism, Death to the 'Enemies of our People!'" The lights went off, the movie began. Mother started making preparations last night. They were going to take Aunt Zubeyda's daughter Nasiba to the "pir"-a sacred place called Rahima Khatun in Nardaran (historical town on the Absheron Peninsula near Baku.). Many women and children go there. My mom agreed to take me, too, after I begged her many times. Around 7 a.m. about 20 women and children boarded the electric train at the train station in Sabunchu (town as well as a district on the Absheron Peninsula). Around 9 a.m. we arrived at Mashtagha (Settlement on Absheron Peninsula). We rented two carts (pulled by horse or donkey) and headed off to the little town. When we arrived, we discovered that there was a big lock on the door of the sacred place, and a Komsomol was standing beside the door with a rifle in hand. Even though Aunt Zubeyda begged the Komsomol to let us in because her little girl had a heart problem and even though she promised to give alms, the Komsomol wouldn't listen to her. Finally, the Komsomol cursed the sacred place, Aunt Zubeyda and us. My mom couldn't stand it, so she took the group back and told those in the cart: "Brothers, we have come such a long way here, we don't want to return not being able to have accomplished anything. We'll pay you just take us to the town mosque so we perform "namaz "(Islamic prayers) for this girl. "I am a Soviet Pioneer. I have informed the authorities about people who fast, perform 'namaz', read the Quran, visit religious sites, invite guests into their homes, and who buy lots of products in stores. But my greatest act of courage was when I turned in my own father as "An Enemy of the People". The cart drivers replied: "Sister, what are you talking about! All the mosques around here have been converted into clubs, movie theaters, restaurants, or shops now. We thought that you had come out here to see the village. Otherwise, we would have told you not to bother." We returned to the city disappointed. When the women and children got off the train back at Sabunchu, we heard that there was a new tower near the seaside. People could climb up there and jump off it with a parachute. We wanted to go and see. We started walking towards the sea. After a bit, we suddenly came upon thousands of people standing near the bridge. People were crying, screaming and carrying on. Policemen were sending the people away. My mom went forward. I grabbed her hand. It was a horrible scene: men were standing on one side, women and children on the other side. Everybody was crying. They were all trying to say something back and forth to each other, but it was so loud that you couldn't hear anything. Left: Turan Ibrahimov, Ahmad Jafarzade's nephew, is the person responsible for making his uncle's work known. He has the collection of Ahmad's literary works and is preparing several of his works for publication such as "Unfinished Diary" and "Unnamed Heroes" (Adsiz Qehramanlar) about life in Azerbaijani villages during Stalin's repressions. Turan is the son of the late Aziza Jafarzade. It turned out that these people had been brought from villages in Karabakh (Garabagh [Alternative spelling: Karabakh via Russian] is a region in western Azerbaijan which has been under occupation by Armenians since 1992), Lankaran (a town in the south of Azerbaijan close to the border with Iran), and Mughan (A region of Kur-Araz river lowland in central Azerbaijan. ). They had been forced to leave their houses in a hurry at night. They were promised: "according to Stalin's decree, you will be given a very good place to live in Kazakhstan." They had been brought to Baku in cargo trains. Now they were separating the families, putting women and children were put in the same cars, and men in different cars. That's why everybody was making such fuss. These people were innocent, everyone was being deported, including Bolsheviks, Pioneers, Stakhanovites (in Soviet Union, a person who followed the example of Aleksei Grigorievich Stakhanov, who worked so hard as an overachiever on the job), strikers, old and young alike, both men and women. A hushed silence descended on the neighborhood. Mashadi Ganbar's daughter-in-law had been sent into exile yesterday, and his four grandchildren were hauled off to an orphanage. Only a month ago, his son had been denounced as an "Enemy of the People". The old man begged so many times to let the mother take her children with her, or let them stay with him, but the NKVD agents wouldn't allow it. After they left, the old man went into the kitchen and killed himself with an axe. His wife couldn't bear what she saw and she took the cord used for hanging out the clothes, tied it to the window and hung herself. The dead bodies were washed (It is a tradition in Islam that before burial, the body of the deceased is ceremonially washed) and placed next to each other in the middle of the yard. No one could be found to recite the funeral prayers. The ones who knew how to do it were afraid to say anything. There was no choice but to bury the bodies without any ritual prayers. Forty to fifty women gathered in a circle in the middle of the yard. Nanabaji came forward screaming: "This is disaster, disaster!" "We lost the only son in the family!" "We lost the young bride!" "We lost the infant babies!" "The land cries, the rocks cry. Sobbing, Nanabaji started over: "This is a disaster, disaster!" When she said this, it felt like the whole world had united together - not just those women in the yard. And like the women, the whole world was saying in chorus: "What a disaster!"